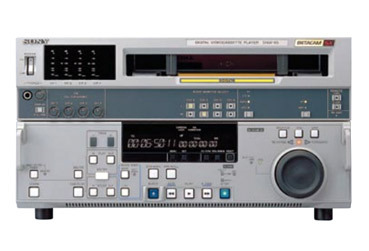 Variable speed control from -1 to +2 times with noiseless image and digital jog sound (Betacam SX playback only). DMC (Dynamic Motion Control). Shot mark, REC start mark and virtual shot mark handling. Versatile interfaces: analog composite and component video outputs, component SDI output and four channels of analog audio outputs, AES/EBU output, two audio monitor outputs, RS-422A control, RS-232C control, parallel 50-pin remote, control interface, video processor control interface, (Parallel 15-pin), and time code output.